Join us Thursday mornings at 10:30 am for the Family Fun with French program and help get your preschooler ready for school. A typical story time consists of a variety of French and bilingual (English/French) songs with handouts provided and books read aloud in combination of French and English we also bring in some informal vocabulary building exercises. It’s a fun and varied circle time. 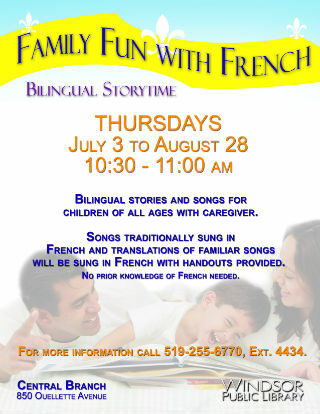 WPL’s Family Fun with French program is ideal for families considering French Immersion or already registered. The program provides an introduction to French books and resources, an opportunity to learn songs and vocabulary, and a chance to meet other families preparing for French school. It’s a great way to give your child a leg up as they transition to school. The program is appropriate even for those with no previous knowledge of French and staff will introduce parents to traditional and electronic resources to improve their own French and support their child’s learning as well as bringing in fun books for the children to read. Children of all ages are welcome with one or more caregivers although the program is most appropriate for preschoolers aged 3-5. No registration is required. For more information please call Kate at 519-255-6770 x. 4434.